3.7 out of 5 based on 27 bloggers and 3 commenters. 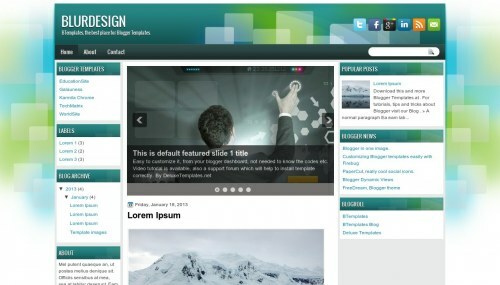 BlurDesign is a free blogger template with 3 columns, left and right sidebars, fresh look, slider, social bookmarking icons, geometric motifs and gradients. This template does not work as-is. Blogger shows all code instead of the template. Never mind. I figured out what I did wrong. My textedit program was stripping out HTML. I should have noticed. I have a question please answer that!